Being in the presence of a really old tree–think 1,000 years or more–inspires awe and, hopefully, an elongating of temporal perspective. Your thoughts are led away from the familiar concerns of yesterday, today and tomorrow, and the lifespan of the tree gradually comes into focus. The rise and fall of cities and scientific paradigms become more relevant than the rise and fall of hairstyles and political buzzwords. And perhaps the younger trees nearby grew from seeds produced by that aged individual. Or, with the help of the Archangel Ancient Tree Archive, perhaps the seedling in your backyard is that aged individual. The trees that we collect from have coped with the margins of life in their long life span, and in that they will have the greatest health and ability to survive. As they are introduced back into the environment, the seedlings from these trees will have the greatest survivability when planted. It should be noted, however, that genetics are not the only reason that some trees live longer than others. A tree’s supply of water or sunshine can shepherd it to longevity, and the assertion that seedlings from ancient trees will exhibit superior performance because their DNA “is essentially a memory for surviving calamity” borders on the Lamarckian. Archangel’s idea for a genetic archive renders a much more interesting perspective, and an interesting format as well: the archive’s ‘data’ (plant DNA) will be stored by clones of the original specimens in groves of living trees, with multiple clones of the same tree growing in various locations so as to avert losing data to a single natural disaster. We are preserving the best known genetics to give ourselves a chance at something that could be great and something we will learn about for generations to come. …If we allow these very old trees to tip over and die, we will never have the opportunity to study those genetics in the future to understand why they were able to make it so long and get so big. …What Archangel is doing is difficult, but we believe in the long run this work will be very valuable. Regardless of whether or not the genes from these “very old trees” turn out to be any different from the average member of the species, the forward-thinking what-ifs here are laudable. Archangel is taking something awesome and making it available to future generations, recognizing that their knowledge and research methods will most likely be more capable than ours in unexpected ways. It’s not just about preserving trees, it’s about preserving options. 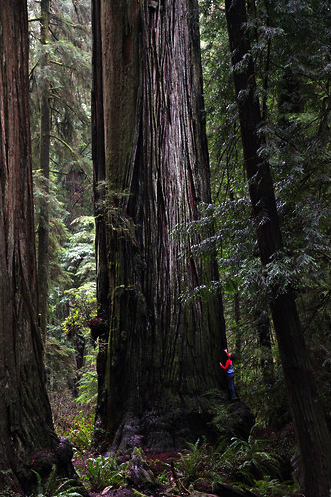 And besides…what better thing to copy than a forty-story tall redwood?